Blacku’s big wondering eyes were also black, hardly distinguishable from the rest of his body. As he swam, He ran into a dozen of his siblings. He smiled and waved his fin at each of them. Right then, someone sprinkled fish food over the 100-gallon tank. All the tank inhabitants got into an eating frenzy. Poor Blacku was surprised at the reaction of his siblings as they were swimming helter-skelter trying to grab a morsel of food. He was expecting a smile from them or maybe even a “Hi”. He almost pouted, disappointed. But his curiosity got the better of him. He observed his mother, his siblings and many other mollies swimming up and diving down. They swiftly grabbed the food flakes in their mouth. “That was amazing!” he thought. Blacku felt hungry too. In a few seconds a sizable flake came floating by him. Blacku grabbed it and munched on it happily. “This tastes yummy, “he said to himself. Being a small fry, that filled him up pretty good. In a few weeks, Blacku grew much bigger. He was almost two inches long. He had a streamlined body. He could swim fast through the water and swerve and change directions quickly. He was very eager to learn. He ventured all around the water tank. He looked into every nook and corner. He explored inside caves and sometimes ended up getting chased by some big fish whose favorite hiding place he had ventured in without permission. At last, he found his very own hiding place, quiet and perfect – just like him. Even though, Blacku was happy spending time by himself, he made a lot of friends too. He was liked by one and all. His siblings actually were quite friendly towards him when they were not preoccupied in feeding. He liked to play with them in the morning where there were white and beige shells and colorful rounded pebbles. During feeding time, he swam to the furthest right corner in the back and grabbed the food morsels that came drifting his way. Luckily no one disturbed him at this spot. Blacku passed his childhood days, happy and carefree. But one day Blacku, while he was swimming carelessly around his hideout, a plastic net came and surrounded him on all sides. In a few seconds, he was hauled out of water. Blacku gasped for air and jumped around in the net. But he did not have to wait too long. He was put in a plastic bag, filled with water. There, he found two other mollies in the similar situation. In the midst of danger Blacku, decided to smile at them and say “Hi”. The scared fish looked at him in wonder but they felt a tiny bit better just from having such a courageous companion. The plastic bag made its way finally to a middle-class household of a gentle middle aged woman. 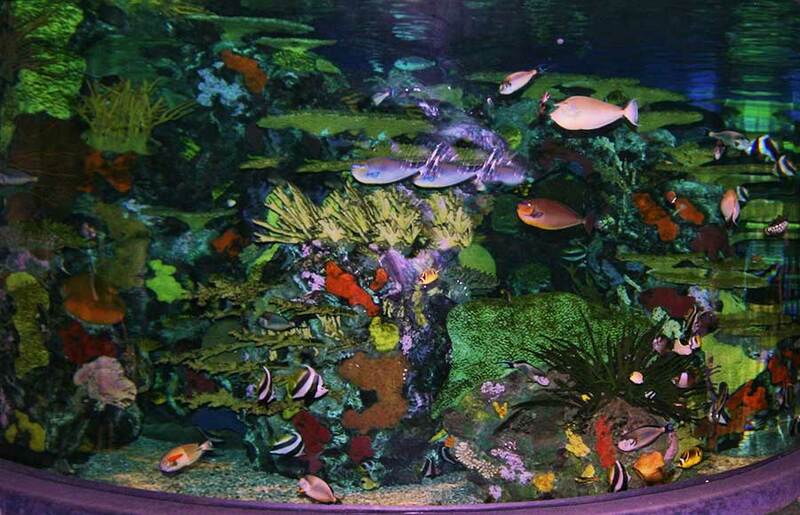 In that cozy home, there were many fish, swimming in a beautiful aquarium. On its rear side was a colorful backdrop that had pictures of corals and plants and colorful rocks. The bed of the aquarium had pebbles and shells. It also had ornaments of various sizes with plenty of places to hide and sleep. Blacku and the two other mollies were carefully transferred into that aquarium. Every fish in the aquarium noticed that his black eyes were hard to distinguish from the rest of his face and body. He stood out like a dark shadow among the colorful fish. Within a short time, he had made new friends there. He had a nice disposition and did not believe in getting in anyone’s ways. There was a good supply of food sprinkled every morning and evening by the lady of the house. She would meticulously change the water every other week. Blacku had all his major needs satisfied. As he learned to adjust to his surroundings, the new aquarium now became a comfortable home for Blacku. When winter came, the water got a little cold at night. The fish ate and swam more to keep themselves warm. It soon became clear that there was a greedy fish among the group. His name was Dalmatian. He had big white and black spots all over his body. Dalmatian was growing fast as he gobbled big portions of the food. Once he grew considerably bigger than Blacku, he started to bully him. Before the little black one could swim to the veggie pellets or protein flakes, the spotted one would speedily grab the morsels of food that had come floating near Blacku. Being the peaceful kind, Blacku ignored the attack and went searching for food in other directions. Couple of weeks went by like that. With Blacku taking a passive approach, he seemed to be getting less and less food every day. He started to grow weaker as days passed. One morning, when he smelled the food sprinkled in the water, he could not muster enough energy to swim to the surface. He lay at the bottom of the bed hiding in a dark corner. All his other fish friends darted up to the top and grabbed the food. The owner of the aquarium, a middle-aged lady, loved her fish. She would look carefully to see that all her fish were doing well when she fed them every day. She immediately sensed that Blacku was not doing well. So, she dropped more food in his direction. But as usual, before the food reached Blacku, Dalmation intercepted and made it his meal. Dalmatian was happy to get that extra food. After getting a lion’s share of food, he started to bother little Blacku with snide pushes and bites. Poor Blacku tried to run away from Dalmatian with the little strength he had. His body was getting limp and he was feeling numb. Things got worse when Blacku found himself getting caught in a big fish net. He feared that end had finally come and said his prayers over and over again. Now, the caring lady actually was trying to help Blacku. She put him in a small aquarium of his own and sprinkled bits of food for him. Blacku felt better in the new changed waters and started to nibble at the food again. He started to gain back strength slowly every day. Blacku also found himself growing bigger and stronger after a couple weeks. In a month, he was almost the size of Dalmatian. He felt a bit crammed up in the little aquarium. He also was missing all his friends and the cool hiding places to play in. Almost as if the lady could hear Blacku’s wishes, she decided that it was the right time to transfer Blacku back to his old home. Blacku at first could not believe his eyes. He excitedly flitted from one end to the other and circled through the familiar ornaments. After a while he went up to his old pals and said “Hi friends, I missed you all.” He wished all the other fish but he swam away when he saw Dalmatian. When their eyes met again he avoided any direct confrontation. This time Blacku clearly noticed that Dalmatian had not grown much while he was away and they were now equals in terms of size and strength. As Blacku swam around his old hiding place, remembering his hard times. He felt like taking revenge for the past wrongs. However, the bitter feeling made him sick. It almost took away the joy of meeting his old friends. Blacku reminded himself how he was loved and cared by his mistress. After some internal struggle, he decided to erase the revengeful thoughts and forgive Dalmatian for his greedy behaviors in the past. However, he did not forget the hard-earned lessons. He was cautious with his every move. He kept a big distance with Dalmation specially when he slept at night. In the morning, he was up early. He strategically moved to the top surface. He was very attentive and determined not to miss his meal. At the expected time, the lady came by and sprinkled the fish food. She was careful to sprinkle enough food for all. Blacku propelled his back fin and darted to the nearest flake. Troublemaker Dalmatian was in his way creating an obstacle. But Blacku moved swiftly past him and came back in a circle and successfully grabbed the flake right before Dalmatian. This time he was not letting anyone grab what was rightfully his own. In a couple of days, a female white molly joined their aquarium. She had a steam-lined body and shot through water at amazing speed. Blacku could not take off his eyes from her. He thought she gleamed like snow. After a while, Snow turned around to look at Blacku. “Hi handsome” she teased him. “Hi there” Blacku smiled shyly. He liked her friendly attitude. Dalmation came close to Snow and showed off his twirling movements. He tried to impress her with tricks as well as sweet words. Blacku looked from afar. He did not like Dalmation’s overt approaches but he was light hearted about it. Anyway, he thought, if Snow and I ever had kids they would most probably look like spotty Dalmation. Maybe it is better that I keep out of this anyways. At night, Blacku was woken up by the stirring of another fish moving into his hiding place. At first, he was prepared to chase the fish out. Then he realized that it was Snow. She had a sheepish look on her face. “Do you mind sharing?” she asked. “No…not at all,” Blacku smiled back. He really did not mind. In fact, he was quite happy about having a new friend. Blacku swam back to his favorite corner and prepared to sleep again. When he woke up next morning, he saw Snow still there, sleeping right next to him. He tried not to read too much into this. He brushed away any thoughts of physical attraction that were forcing themselves into his mind. This pattern was repeated every night. On the fourth night, Blacku was so smitten with Snow that he could not sleep. He lay awake till Snow came close to him in his little hideout. He openly admitted his feelings and kissed her that night. During the day, the two went about their usual business and no one found out about their secret love. But that did not stay a secret for too long. In three weeks, Snow was visibly pregnant. Blacku made sure he brought her extra food as she needed the nutrition for the growing embryos. Everyone was happy to see how Blacku cared for her needs – that was everyone except Dalmation. He was seething with jealously. One morning, the owner lady noticed that Dalmation was harassing Snow. She mistook it for playful advances. She smiled and went about her work. She had a busy day planned for herself. She sighed as she left the side of the aquarium. Her heart felt heavy for no reason at all. Dalmation blocked Snow’s way and was preventing her from getting to the food that was sprinkled. Blacku came swimming to Snow and tried to guard her. There started a fight between him and Blacku. Blacku reacted with an offensive move but stopped himself immediately. He thought of his little sons and daughters that were growing inside Snow. Some of them would look just like Dalmation. At this thought his heart was filled with sympathy for Dalmation. On the other hand, Dalmation was acting like a possessed demon. All his hatred for Blacku and frustrations of unrequited love for Snow surfaced in his attacks. Dalmation’s sharp teeth sank into the bottom of Blacku’s tail fin. In a swift move, he bit it off. With an injured and non-functional tail fin Blacku lost control over which way he was swimming. Still Blacku tried every means to defend himself and Snow with all the strength left in him. Dalmation’s mad frenzied attacks started to take a toll on Blacku. Dalmation was slowing gaining control over them. Suddenly, he grabbed a hold of Blacku’s cheek bones and tore them off one by one. Then he tore off his gills. Blacku’s body slumped to the bottom of the aquarium. Blacku’s heart broke when he realized that he will be leaving behind his sweetest love and his unborn off-springs. His tortured soul was torn into thousand pieces and entered the womb of Snow. The lady came back home and went to the aquarium to check up on her fish. When she saw Blacku’s lifeless body at the bottom corner of the aquarium, tears streamed down her cheeks. She picked him out with a fish net and buried him in her garden under a tree and covered his grave with white flowers. Snow hid herself in Blacku’s hiding place and cried her heart out. When anger left Dalmation, he was stunned at his demonic actions. He was filled with remorse. He went to the other corner of the aquarium and wondered why Blacku never attacked him back. In a few days, Snow was ready to deliver her off-springs. They came out in all different combinations of black and white spots. Many of them looked like Dalmation, who was watching this from far away and slowly understanding what a big heart Blacku had. Finally, the last little baby that came out was completely black in color. This brought tears in the eyes of all the onlookers. The lady of the house was also watching this from outside the aquarium. She slowly walked to her writing desk. She wondered a while and then started writing the story of Blacku….